I, personally, have merged Animal Man and Swamp Thing into one story last month. And while the issues themselves have been building it, technically the crossover hasn't happened. I read this after Swamp Thing and it's hard to rate. Both books kind of stalled, but with an indirectly related plot in Animal Man, it felt more like a stall. I do have to appreciate what it is and it's an interesting idea to get to a point. But I was running off a high after Swamp Thing and this isn't what I wanted. I certainly can't say it was bad, though. Dark Horse Presents is a weird book to rate because I will probably pick it up regardless if it's bad. It's the virtue of being an anthology, I guess. What was bad in the last issue might change in the next and one is continually reading new stories. 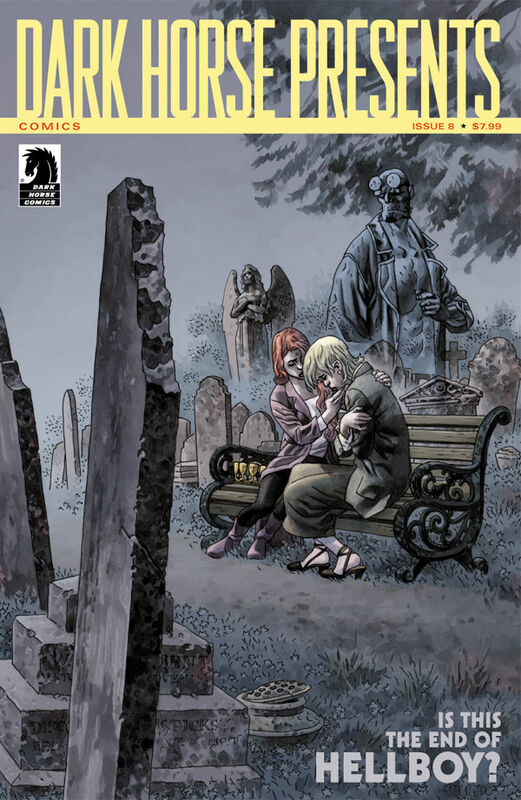 The best of this issue was Beasts of Burden As someone who's heard great things about but haven't read it except in previous DHP issues, the chapter in here sold me on the series. It is fantastic. Everything else kind of hit at an average. Some of the stories had some nice stuff happening, but weren't anything special overall, while others I'm just not a big fan of from the beginning. Another fun story by the Houghton brothers. There's some really funny jokes in here and some hilarious drawings by Chris Houghton, but I felt the main plot of Starla "acting" more lady-like went on too long. It started to get repetitive and I would have liked to delve more into the zombie Native Americans. Again, I can't say it's bad, just wasn't up to the excellence the last seven issues have been. Nonetheless, another issue of Chris Houghton's art is well worth the cover price alone. I'm really loving what he's been doing in here and his style (along with colors Josh Ulrich and Jose Mari Flores) fits right at home and compliments the genre to the most I imagine it can. As I said for Animal Man, this issue felt like a stall where one related plot point was reiterated. But I read through it so fast (unlike Animal Man) that it never really felt like it was delaying something. It kept moving at breakneck speed and acted almost as like a build-up for what's going to happen next issue. Swamp Thing gets the benefit of the doubt from the stall due to it moving the direct story forward. I can't wait for next month when I'm sure Lemire and Snyder will get right back into the driver's seat and take this story to an incredible distance.